The Jeep Wrangler Unlimited returns for 2014 having been on the market for ten years. The Unlimited is the 4-door version of the regular 2-door Wrangler that has been around since the mid-80s, and although it features pretty much the same styling as the 2-door Wrangler, it is built on a long wheelbase to accommodate the additional doors and interior space. Although somewhat less of a dedicated off-road vehicle than its sibling, the Unlimited nevertheless shares both the 2-door Wrangler’s strengths and weaknesses. Jeep last redesigned the Wrangler back in 2007, but part of the Wrangler’s appeal derives from the fact that its styling really doesn’t change all that much. 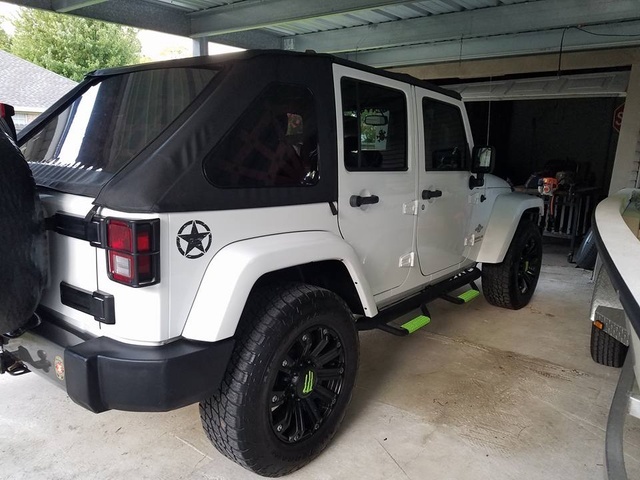 The Wrangler and Wrangler Unlimited both sport the distinctive round headlights, 7-slot grille, exposed door hinges, and soft convertible top (although a hard top is also available on all trims). The only major change to the Unlimited this year involves the addition of two brand-new trims, the Polar Edition and the Dragon. The Polar Edition is also found in the 2-door Wrangler lineup, but the Dragon is only available as a 4-door Unlimited. The mid-upper-level Moab trim does not continue over from 2014. The 2014 Wrangler Unlimited Polar Edition is supposed to be a nod to Wrangler owners who are keen on winter off-roading, as well as a reminder Wrangler’s solid reputation for ruggedness and an ability to meet any and all difficult driving challenges. The Polar Edition features 18-inch gloss black alloy wheels and a body-color hard top. It is based on the Sahara, the second trim up from the base Sport in the Wrangler Unlimited lineup (which is almost exactly the same as the 2-door Wrangler lineup), and distinguishes itself through styling more than anything else. There’s a unique front grille and “Powerdome” hood, mountain-themed badges and decals, special embroidery and accent stitching in the interior, and new white-and-blue trim on the instrument cluster. The Sahara’s standard cloth seats are replaced with heated leather seats, and there’s a black leather-wrapped steering wheel as well. The Unlimited Dragon is actually pretty similar to the Polar Edition, as it too is based on the Sahara and mostly distinguished by unique styling. In this case, the wheels and grille are gold-trimmed and there are two rather large (if somewhat subtle) dragon decals, one running from the front driver’s-side door onto the hood, the other emblazoned on the tailgate-mounted spare-wheel cover. The interior also features gold contrast stitching and trim accents, and golden dragon embroidery on the seats. The Dragon and Polar Edition are both priced at a little over $36,000. All Jeep Wranglers are powered by the same engine, a 3.6-liter V6 producing 285 hp and 260 lb-ft of torque. Both a 6-speed automatic and 5-speed manual transmission are available; the Wrangler Unlimited is actually one of the few larger SUV-type vehicles still available with a manual. All trims are also equipped with standard 4-wheel drive (4WD), and a separate transfer-case lever gives the driver better and quicker control over the 4WD system. Fuel economy has never been good in the Wranglers, and the 2014 Unlimited returns uninspiring mileage numbers of 16 mpg city/20 highway/18 combined with the automatic and 16/21/18 with the manual. The more serious off-roaders will probably want to spring for the Rubicon or Rubicon X trims, which feature upgraded or additional off-road technology like Dana 44 front and rear axles, front and rear locking differentials, 4.10 front and rear axle ratios, a sway-bar disconnect system, and a Tru-Lok transfer case with a large low-range gear ratio. The Rubicon X also adds steel front and rear bumpers and larger rock rails. There’s even a new Trail Kit that includes gloves, D-rings, and a tow strap. Don’t expect too much from the Wrangler Unlimited in terms of entertainment or technology; the driving itself is meant to be the entertainment in a vehicle like this. The Sport offers a pretty basic 6-speaker audio system, and choosing Uconnect infotainment and navigation can add anywhere from almost $700 to well over $1500. SiriusXM satellite radio does come standard on higher trims. Automatic climate control is also available. Safety has never been the Wrangler’s strong suit. The 2014 Wrangler Unlimited received scores of Good on the Insurance Institute of Highway Safety’s small and moderate frontal-overlap tests, but scored marginal on the side impact test, and only managed 3 out of 5 stars on the National Highway Traffic Safety Administration’s rollover tests. Safety technology is mostly confined to what will help you after you’ve left the pavement: hill-start assist, a stability control system with electronic roll-mitigation technology and trailer sway control, all-speed traction control, and optional front-seat side-impact airbags. There are also standard dual front airbags and antilock brakes with brake assist. Keep in mind the the Wrangler Unlimited’s doors are detachable and the windshield flips down; this isn’t a family hauler. Wrangler owners (including those on CarGurus) tend to like the Wrangler quite simply for the fun it allows them to have. They care less for its practicality and poor fuel economy. As our test-drive reviewer points out, you should look for another vehicle if you’re not in the mood for frequent and dedicated off-roading. What's your take on the 2014 Jeep Wrangler Unlimited? Rich Piece of crap, weather stripping leaked, new oil pressure sensor at 14,000 miles, new heads at 25,000 miles, new engine at 30,000 miles. Good thing I had a warranty. Users ranked 2014 Jeep Wrangler Unlimited against other cars which they drove/owned. Each ranking was based on 9 categories. Here is the summary of top rankings. Have you driven a 2014 Jeep Wrangler Unlimited? I have been contacted by Autopay claiming they work on behalf of CarGurus to handle the sale of cars. Is this true? Will 255/75/17 tires with 17" 5 hole jeep rims fit my 2014 jeep wrangler sport unlimited 4 wheels drive jeep?